This is to inform the general public, parents, sponsors and interested candidates that admission form for The International School - University of Ibadan (UI) is now on sales. All interested people should take note of the information below before applying. Should you're hearing about Cambridge Advanced Level (A'Level) for the first time, I had covered some important points about it and other advanced courses recently in my post, "IJMB, JUPEB and Cambridge A’level: Opportunity to Gain Admission directly to 200 Level." Briefly, if you obtain, undergo and pass this programme final exams, you can use such result to seek admission into the university 200 level course or any other schools accepting it both in Nigeria and abroad. Please note that University of Ibadan doesn't run predegree or remedial course. They instead, run this advanced programme which is equivalent to other universities' remedial or pre-degree programmes. With the information at hand, only the university and other institutions accepting Cambridge A'level are admitting students form UI International School. The school runs an intensive, result-oriented and character building one-year acceleration Advanced Level Programme within its serene environment inside the University of Ibadan campus. We are a Cambridge registered centre with a state-of-art equipment for practical classes as well as qualified and experienced teachers for the various subjects being taught in the School. The International School, University of Ibadan (ISI) known for more than fifty years of academic excellence has as its kernel, the development of our students to be successful in their various careers by building not only the understanding and knowledge required for their admission into the 200 Level in the Universities of their choice (within and outside Nigeria) but also creative learning and the thinking skills that could help them become independent Scholars in their various fields of study. Limited accommodation is available and the security is guaranteed. This is a School that is meant for every Pythagoras and Isaac Newton of our time. Candidates must possess at least five credit passes in their SSCE result. 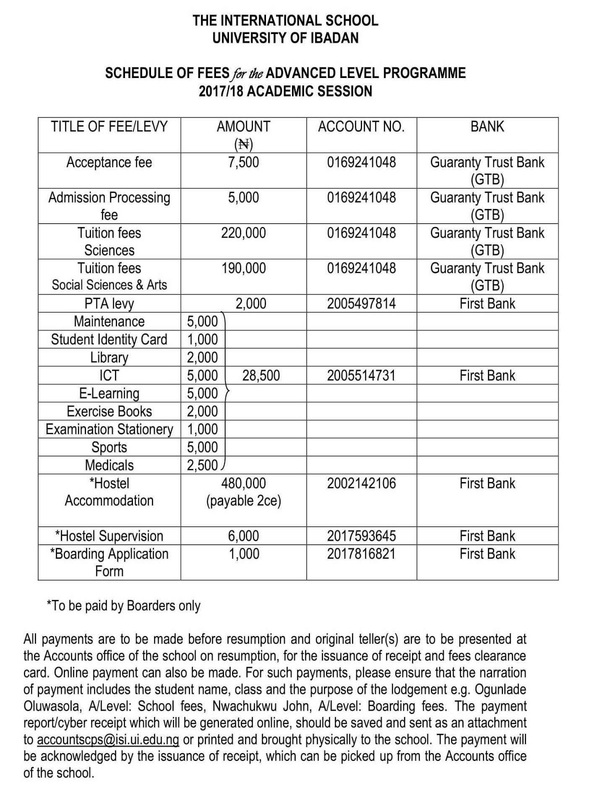 Such credit passes must be from relevant subjects to their proposed courses in university. Candidates must be ready to undergo a nine-month study in the school and pass the final exams to be qualified for 200 level admissions. Candidate must come along with the original and two photocopies of the O-Level statement of results.